Our long time clients, Ehrhardt’s Waterfront Resort, asked us to complete a ground up website redesign. 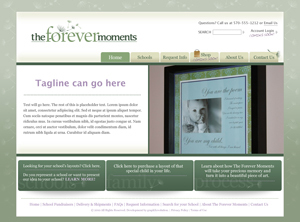 The original site we created was coming to the end of its life cycle so they wanted to breath new life into the design. Using a design they provided, we tweaked the design to be web-friendly and put our magical spin on the functionality. The back end is the most spectacular part of the project in our opinion as it uses our brand new CMS system. The administrators of the Ehrhardt’s website are able to perform many more functions than in the previous version of the site. The functions include an upgraded photo gallery, YouTube video feeds, TripAdvisor feed, ability to edit any of the site’s content, add and delete pages, see their most visited pages on Google Analytics at-a-glance, and the ability to edit the site’s SEO. With the addition of these great features, Ehrhardt’s administrative staff will no doubt keep their site fresh for visitors. Coming soon, an Ehrhardt’s mobile website. If your site is feeling a bit tired, visit the graphXevolution web design portfolio, give us a call today and we’ll put together a detailed proposal including a design concept. Our phone number is 484.298-2272, or drop us an email at info@graphxevolution.com. 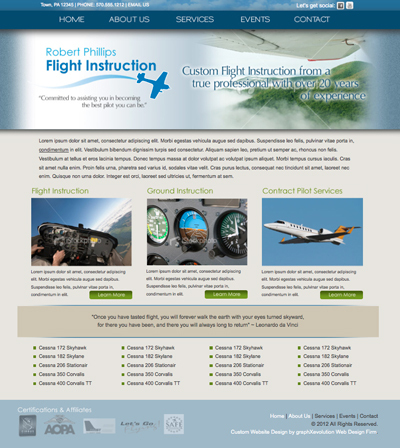 RPFlight, a flight instruction school owned by Robert Phillips has named graphXevolution, Inc. their official web developers. The current site is being completely redesigned and will allow visitors to review Mr. Phillips services, contact him about flight instruction, and in a future phase, provide students with online instruction and course access. Check out the approved design. Launched early in August 2011, the PA Hutchison Book Manufacturing company’ website is a combination of editable content, dynamic information and relevant information PA Hutchison’s customers were looking for. Before the website redesign, the website lacked important information about services offered by PA Hutchison, but now offers customers a way to learn about services and even submit online quotation requests. Take a peak at the new PA Hutchison website and let us know what you think. If you have a website that could benefit from website redesign, give us a shout and we’ll work with you and your team to create a site that reflects your company’s personality and delivers what your customers need. We’ve been INSANELY busy. We’ve been servicing new clients and getting ready to take a much needed break in the beginning of July. A school fundraising site that will feature really cool and different products for school’s to offer parents. Gone will be the days of $60 popcorn. 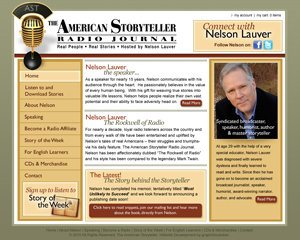 A website that will feature the speaking services of Nelson Lauver, as well as the ability to listen to and purchase stories that are very popular in the ESL community. 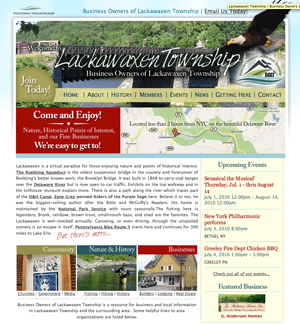 This little gem in the northeastern part of PA features activities and events for nature minded people that love things from Eagles to Fishing and Hiking. This site is just about ready to launch. 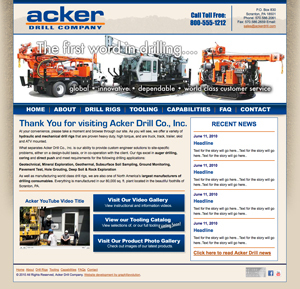 Featuring the world class products of Acker Drill Company, the website will serve as a portal for customers and potential customers to be educated on these products. 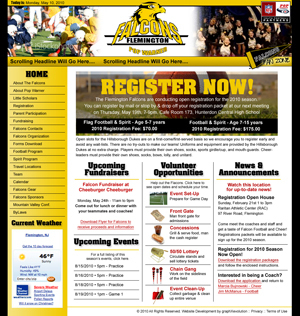 A New Jersey, Pop Warner football team selected us to create a custom web platform to be used by parents, administrators, players and fans to keep up-to-date on everything Falcons related. We’re planning a road trip to this place. My mouth starting watering the second I looked at their bakery and candy selection. 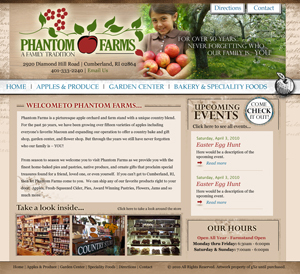 This website will be a place for visitors to not only review what the farm has to offer, but also a listing of their lastest events. These are just a few of the latest projects we’ve been commissioned to complete. More are in the works as graphXevolution continues to grow and serve the business community with AWESOME web development and supreme customer service. Credibility – worthy of belief or confidence; trustworthy says Dictionary.com.. Lets face it, times have changed. No longer is business done simply by a smile and handshake, or accepted based a persons “word” as it once was. Credibility has all but vanished from business in a sea of lawyers and greed. That software you just bought and tried to install on Vista; when it doesn’t work you call the manufacturer for assistance.. If your lucky enough to talk to a live person, the first thing they try to do is look for a way out.. “There is a problem with your computer, check for updates, if that doesn’t work reinstall or call Micro$oft.” A similar story when you call Micro$oft, “Nope can’t talk to you until you sign up for our $39.95 tech support package and when you do we’ll point the finger back at the software..” Or try walking into your local car dealership and asking what your favorite car costs, you may get an answer after a 15 minute test drive and sitting in the sale persons cubical for an hour. Or better yet, ask what the trade-in value of your car is.. The point is, credibility is no longer a given in todays business world; even to the point that the average consumer doesn’t even consider it when making a purchase. Though it has been my experience that if you are able to build a personal relationship with a client, one that allows the client to look beyond the instinct “what’s this guy trying to sell me that I don’t need” and show them that you are a credible business, one worthy of trust and honest, sincere advice; your chances of a successful business relationship with them increases exponentially. So how do we bring credibility back into business? At graphXevolution, its simple.. Honesty – Be honest not only with the client but with yourself. There is nothing wrong with saying to a client “I don’t know” because immediately following should be “But I’ll find out”. Even the best person in their respective craft doesn’t know everything about it, there is always something to learn. Be honest with yourself to know your limits and be honest with your client. Be Upfront – Don’t be the sales man at the car lot that “has to talk to his boss” when really he’s just going to grab a cup of coffee. Clients hate to be given a bill for additional charges, be it reasonable or not, when they are not expecting it. Nine times out of ten, a business knows well ahead of time that extra expenses are going to be incurred.. don’t wait, talk to the client about it so they can prepare and are expecting it come invoicing time. If you follow item 1 and are being honest, generally it does not become an issue. Be Fair – Be fair, again, not only to the client but to yourself. Charge a fair price for the value you bring the client. You as a business have a nitch that makes you successful or you wouldn’t be in business, identify that and be truthful to its value. I have found that being the lowest price isn’t always the best, many clients look to an average price rather then the cheapest. Building credibility with that customer will often bridge the gap between your price and the “cheapest” because credibility in it of itself has a value. Every business wants to make as much money as it can but be fair to yourself and your client. Say what you are going to do & Do what you say – Identify in detail what you are going to do for the client and be truthful to that. To me, there is nothing worse then saying you’re going to have a deliverable to them by a specific date and not being able to meet that deadline. Its like waiting for a package only to come home to the yellow sticky on your window because there was no one home to sign for it. Obviously some things are out of control, but being honest and upfront (items 1 & 2) will help to ease the client. If your being honest and upfront with yourself when planning deadlines, you can eliminate the vast majority of delays. Building credibility into your business model can separate you from being another average company or the one that people talk about. The best form of advertising is word of mouth, credibility is what people talk about next to price.. “They did a great job on my website, gave me exactly what I needed without the stuff I don’t.”.. “Well so and so did my site but they didn’t tell me that the artwork wasn’t mine, they sold me a blog but What’s a blog?“. At graphXevolution, we are not the cheapest nor the most expensive but our credibility along with knowing our nitch and keeping within it have allowed us to be successful both in business and in customer satisfaction. We take great pride in not having a “list of references”, rather a portfolio of which anyone can be contacted. Thank you to Universal Publishing for choosing gXe as their official web design and e-commerce development agency. In the coming months, a new website design for Universal Publishing, located in northeastern Pennsylvania who is in the business of producing educational materials, will be completed. Utilizing a FABULOUS E-commerce solution and Web Development platform in one, Universal Publishing will have a state-of-the-art website that allows top level customer service, marketing and Web 2.0 semantics. Stay tuned for updates on the progress of the web development. Recently, graphXevolution completed The Downtown Hawley Partnership website project. Working closely with one of the board members, Aimee Skier allowed us to prove ourselves to the Skier family. When ready to redesign and develop the AMSkier Insurance website, graphXevolution was approached and ultimately chosen to provide web design services to AMSkier. A full redesign that will show off the “not so ordinary, but extraordinary” insurance company and allow for AMSkier to update their site and include several dynamic features. Stay tuned for updates in our portfolio as the design and site evolve.